I ran into A.J. earlier this month, walking aling Seventh Avenue near 34th Street. She had been debating on whether to add color or not, but is pretty happy with the way this tattoo looks. 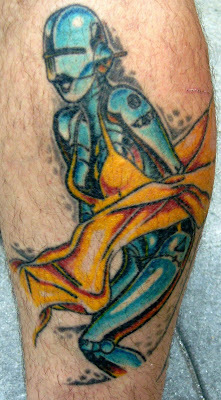 This tattoo was created by Junior at Adrenaline Rush Tattoo in Newark, New Jersey. Thanks to A.J. for sharing this lovely tattoo with us here on Tattoosday! Born in Costa Rica, a one-time resident of Canada, and now a denizen of the Bronx, Oscar has traveled all over the world. He expressed his passion for mountain biking to me as we talked in the Amtrak section of Penn Station. 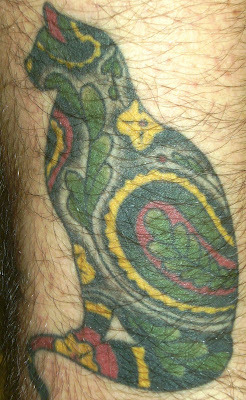 The detail is quite good, almost three-dimensional, and the tribal flourishes up and down the leg add volume to the piece. 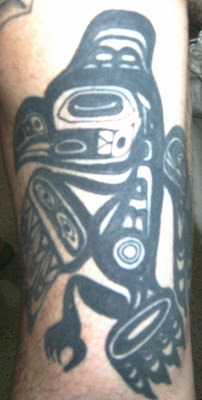 This was his first tattoo, inked on his birthday, after many years of thinking about tattoos. He waited until he was ready, so that he could get something with deep meaning for him. 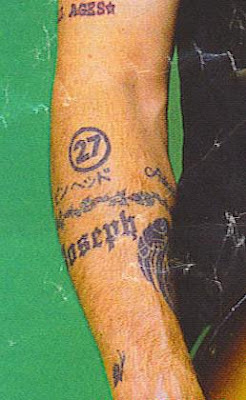 Since then, he has added three other tattoos, all created by Richard at Jent's Tattooing in Yonkers. Oscar spoke of the raven's relationship with God. In the folklore, Raven helps the gods to raise the moon and the stars. He also is known as the prankster, who is always trying to catch the Sun. Many thanks to Oscar for sharing his amazing tattoos with us here on Tattoosday! 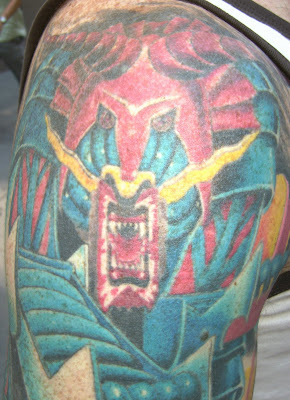 As a huge fan of Judas Priest in the 1980's, I recognized the basis for this tattoo immediately: the cover art for the 1984 album Defenders of the Faith. 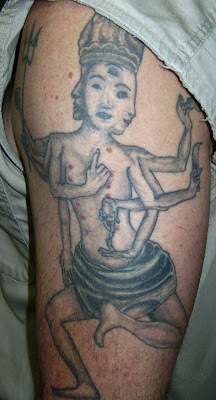 Gregory has four tattoos and is a fan of Japanese-style art. 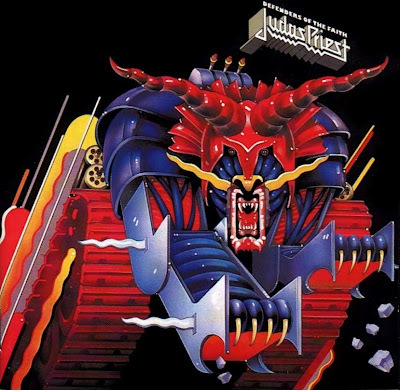 This album and its predecessor, Screaming for Vengeance, boasted cover art that had a distinct Japanese influence. He worked with the artist, C-Jay at Rising Dragon in Manhattan, to modify the design slightly, removing the tank treads and other militaristic elements from the original design. Thanks to Gregory for sharing his amazing tattoo with us here on Tattoosday! 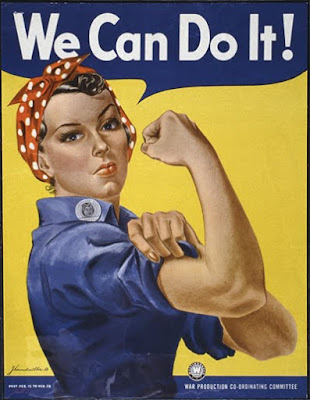 This image is identified with the character of Rosie the Riveter, and was introduced by Westinghouse to rally the home fires in support of the troops abroad. The image has transformed, through time, to take on a greater meaning, that of female empowerment. This tattoo, one of three that Merci has, was created by Chris Dilworth at Tough Luck Tattoo in Lewes, Delaware. Thanks to Merci for sharing her amazing tattoo with us here on Tattoosday! It seems odd and yet is not beyond comprehension that, at the last two bat mitzvahs I have attended, I came home with tattoo pictures. The first time (documented here) was a pleasant surprise. On Saturday, August 8, however, I had no expectations, as it was my daughter's bat mitzvah. 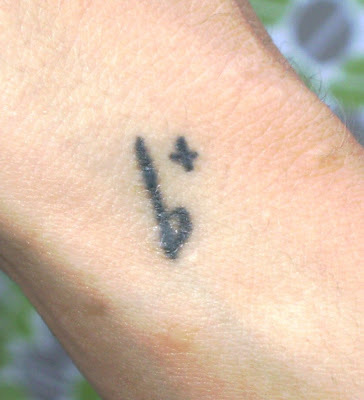 However, much to my amazement, I noticed that one of my sister's closest friends, Avital, has two small tattoos. I was more surprised, considering that Avital is a cantor, and that whereas tattooed Jews are not as rare as they used to be, an inked cantor is still an unusual sight. 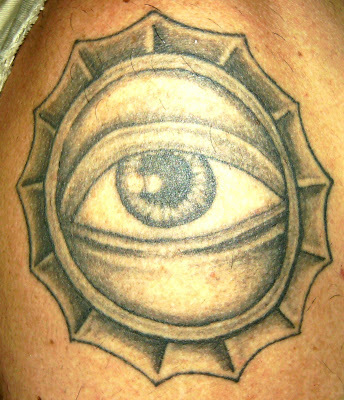 are discreet enough to be overlooked by a discriminating eye, and yet these two small tattoos are large with meaning.
" 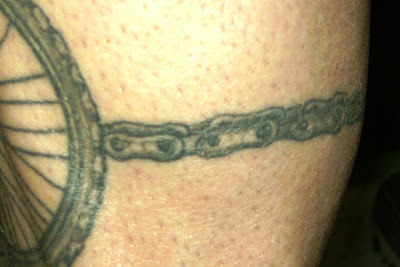 [The b+], though it is very small (1/2") represents many important parts of my life: past, present and future. When my college friend, Erica died in December from Leukemia, I was devastated. Throughout her illness, she managed to have good spirits and enjoy time with her friends and family. Her battle against cancer put life in perspective for me. I have struggled with depression most of my adult life, and when she died, I made the conscious decision to turn my life around, completely. The morning after her death, my father was diagnosed with Glioblastoma, an aggressive brain cancer. Double whammy. 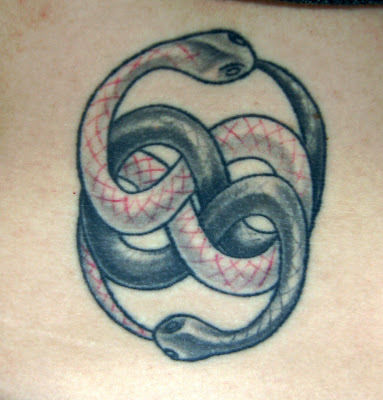 My sister and I had both been contemplating a tattoo for several years, but Jewish guilt always managed to turn me away. After several hours in the ER with our father, we ventured down to Kingdom [Tattoos] and got our matching b+ tattoos. It's incredible how much strength I find from this little symbol on my wrist. "And the B in the b+ tattoo is a flat. in music. since I'm a musician. I can't believe I forgot that part! flats are most commonly associated with minor, "sad" keys. so, there is a bit of sadness in the tattoo. too." "One of the major changes I made in my life after E died was a regular Yoga practice. An unfortunate encounter with a sharp blade left a 1" scar on my inner right ankle. After about 3 months of drawing an OM over the scar with a sharpie (so tedious!) I decided to make it permanent. 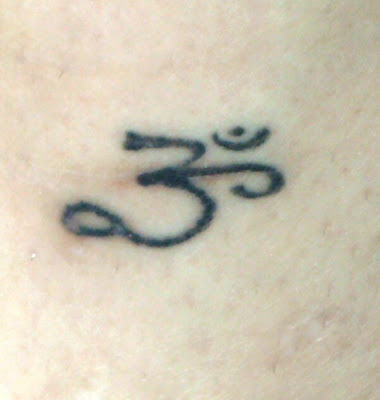 The OM, like my b+, centers me, calms me, and reminds me of the simpler, more important things in life." Much thanks to Avital for sharing her tattoos and the powerful stories behind them here with us on Tattoosday. Ben recalls wandering off one day when he was four years old. He was up in Wells, Maine with his family and no one knew where he'd gone. Fortunately for Ben, someone did know: the family cat. A la Lassie, the feline led his parents straight to Ben, who was sitting under a tree, munching on blueberries. To this day, Ben regards this as a crucial moment in his life when he was saved by the cat. Brendan is now working out of Unbreakable Tattoo is Studio City, California. 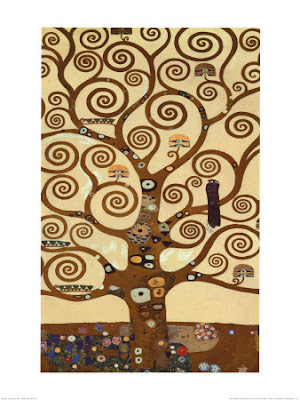 It is, however, also a nod to Gustav Klimt's "Tree of Life". Not an imitation, but a variation. Thanks to Ben for sharing these tattoos with us here on Tattoosday! 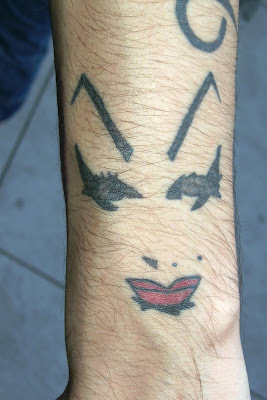 Liza had been researching a design she wanted for her next tattoo and had found the one she wanted. This is, of course, an owl, whose design origins come from the Inuit culture. Work from Halo has appeared previously on Tattoosday here. 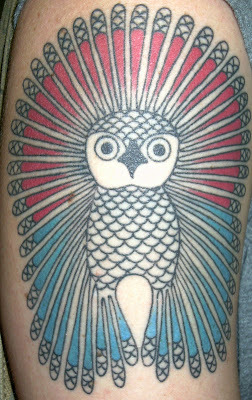 Thanks to Liza for sharing her amazing owl tattoo with us here on Tattoosday! The piece was tattooed by Didi, a Brazilian tattoo artist working out of Angelic Hell Tattoo World in London. Tuck didn't know the source of the artwork, but did work with the artist to modify the design to fit her body. The changes were subtle, having the tattooed girl she refers to as Bridget standing, as opposed to crouching. They also altered the movement within the piece. This is one of five tattoos that Tuck has, not counting additional stars and characters that are also part of her body's canvas. 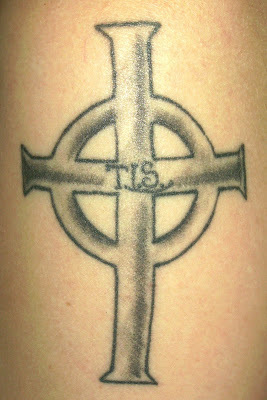 Thanks to Tuck for sharing "Bridget" with us here on Tattoosday! The woman had some words inked on her left arm and, as I paused to consider talking to her, I noticed a colorful tattoo peeking out from under the man's left shirt sleeve. 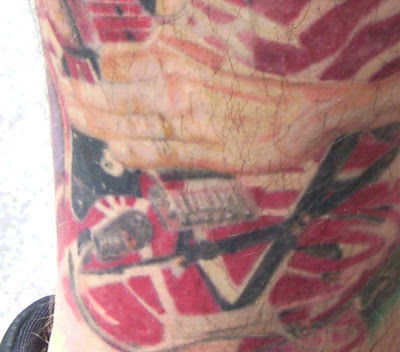 At the end of July, while searching for Green Day tattoos, I met, perhaps, the ultimate Van Halen fan. Nick was hanging out at the side of Madison Square Garden, talking with a friend, and I spotted several rock-themed tattoos on his legs. This was done by a visiting artist at one of the Tattoo Lou's locations on Long Island. Work from Tattoo Lou's has appeared on Tattoosday previously here. 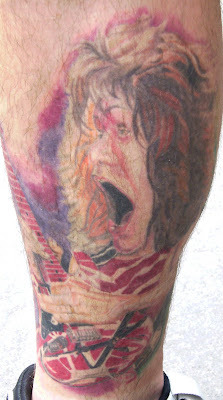 The better of the two Van Halen pieces (in my opinion), on his inner right calf, is this one, inked by Thom at Tattoo Frenzy, in Lindenhurst, New York. Nick says, with certainty, that he has seen Van Halen in concert 394 times (as of July 2009). Thanks to Nick for sharing his rocking tattoos with us here on Tattoosday! He was living working in Champaign, Illinois and, on his lunch break, wandered into New Life Tattoos. The shop had flash with the Seven Deadly Sins and Lust was easily changed to his nickname "Lush". The drawing, he said, "looked like me with a shaved head, screaming". 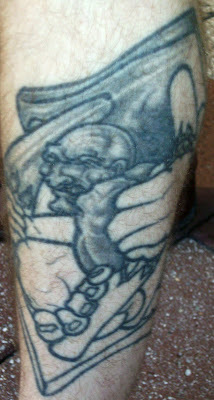 This piece on his left forearm represents a different time and place from his past. Thanks to Jordan for sharing his tattoo with us here on Tattoosday! It was a Hellraiser Pinhead tattoo that first prompted me to approach Travis, but that was not what I ended up discussing with him. The design depicts a man trying to break through bars, to force his way out of prison. If something looks off about this, it is because it does not appear as it was originally envisioned by Travis or the artist. The artist was Travis' brother-in-law, but something unexpected happened halfway through the process. 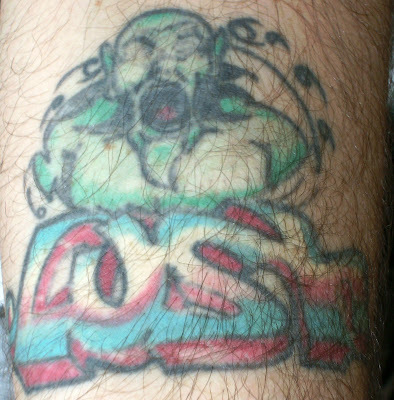 Travis' sister got divorced, and the brother-in-law tattoo artist was no longer in their life. 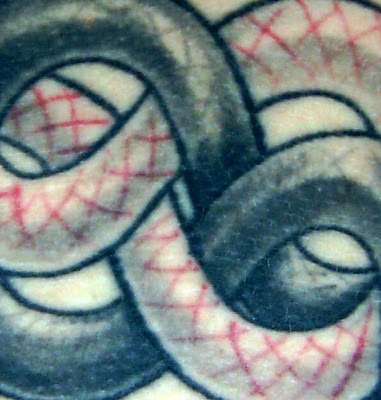 Initially, he wanted to find another artist to finish the piece but, as time passed, he decided that he liked it that way, that the initial tattoo's meaning became charged with additional symbolism. Thanks to Travis for sharing this cool tattoo with us here at Tattoosday! 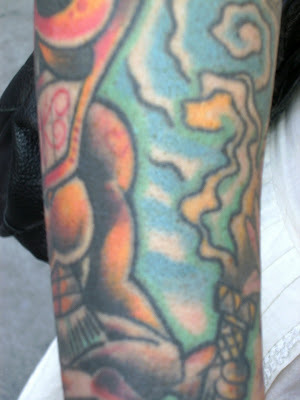 This cool tiki is on the right forearm of Dani, who estimates she is 60% covered in ink. Dani and I met near Penn Plaza and had a lovely chat about tattoos. This tiki is one of her favorites. Don Lussier at Artfreek Tattoo basically free-handed the design on her. Don is the ex-husband of Doris, who is a friend of Dani's. A piece from Artfreek appeared last month on Tattoosday here. She has the tiki as an acknowledgment of her heritage, being part Hawaiian, with ancestors two or three generations back. 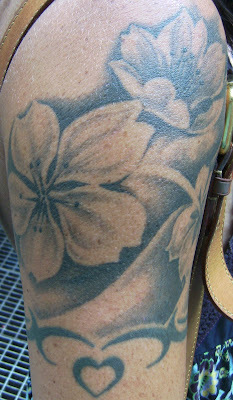 She loves the detail Don put into the piece, especially the heart inked on the tiki's left arm. Mahalo nui loa to Dani for sharing this great tattoo with us here, and helping Tattoosday celebrate Hawaii's Golden Anniversary! I see a lot of crosses in my travels through the streets of New York City, so they don't generally grab my attention. There's nothing necessarily magnificent about this tattoo, but it just goes to show that a crisp, simple tattoo can be as aesthetically pleasing, sometimes moreso, than an overly-wrought elaborate design. Summer had this memorial piece done for her father, who passed away in 2005. His initials grace the center of the cross. 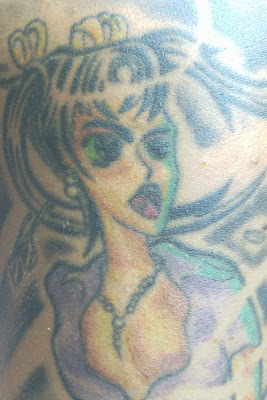 It was inked in Tattooville in Linden, New Jersey. This piece is on Summer's left bicep, she also has the comedy/tragedy masks on the right shoulder blade portion of her back. Thanks to Summer for sharing her tattoo with us here on Tattoosday! It was my boldest moment as a tattoo solicitor to date. A half-dozen or so Green Day fans were decamped in the early afternoon near the artist entrance at Madison Square Garden. Green Day was playing that night and I saw one person inked, a woman, but I chose to announce to all: "I write a tattoo blog and was wondering if any of you had Green Day tattoos?" Sadly the answer was "no," or, I should say, not exactly. Her name is Geraldine and the tattoo she is displaying is a memorial piece for an ex-boyfriend who recently passed away. Joseph was a musician and died of a heroin overdose. 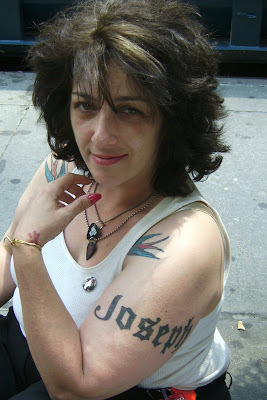 Geraldine is a huge Green Day fan and Billie Joe Armstrong, lead singer for the band, has the name Joseph on his arm, in honor of his son. 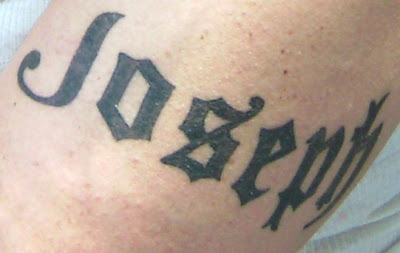 Geraldine chose the same font as Billie Joe's Joseph tattoo and noted that, in the song "Jesus of Suburbia" the first three letters of each word in the song title spell out the first three letters in the name Joseph. 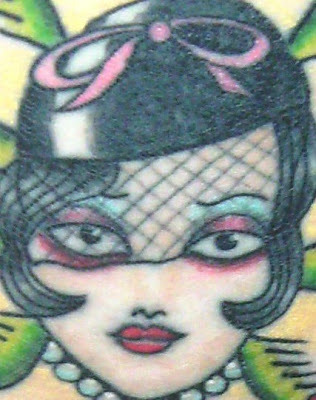 She had this tattoo at Ink Inc. in Kingston, New York. 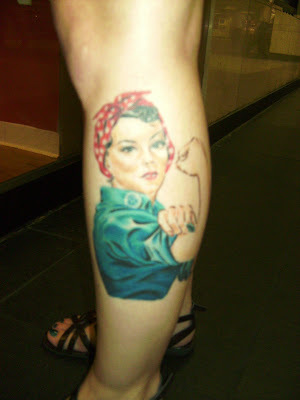 Thanks to Geraldine for sharing her story and tattoo with us here on Tattoosday! She told me that the drawing was indicative of her state of mind at the time it was inked. Her boyfriend had just moved out and she was feeling reflective (thus the hand mirror). "I realized today when you asked me the significance of my mermaid tattoo that I probably would have been better quoted saying the absolute truth. The underlying universal secret wish of all girls and women alike... I've always wanted to be a mermaid." The spider is modeled after her mother's pet tarantula, Shelob, who is named for the giant spider in The Two Towers, book two of The Lord of the Rings trilogy. I asked her what Mom thought of her ink and Elaina rolled her eyes and said that her mother recently wept when she told her she was planning her nineteenth tattoo. And, Elaina added, her mom is no stranger to ink. 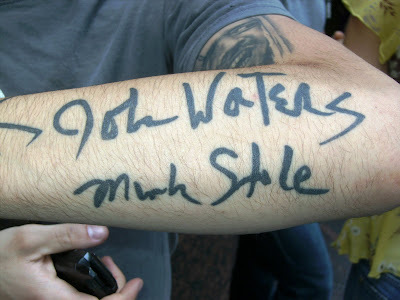 She told me that her mom was tattooed by legendary tattooist Lyle Tuttle during the Rolling Stones' Tattoo You tour. 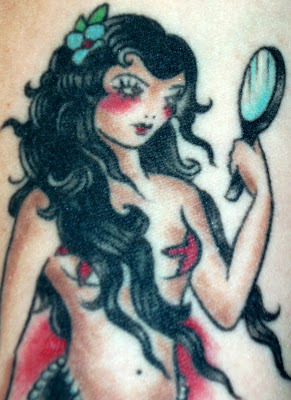 The mermaid was tattooed by Claire at Funcity Tattoo in Manhattan. 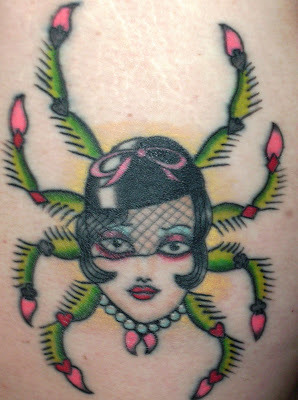 The spider on Elaina's thigh was done by Neal Aultman at Physical Graffiti in New Jersey. Timing is everything when it comes to successful inkspotting. Luck is essential. 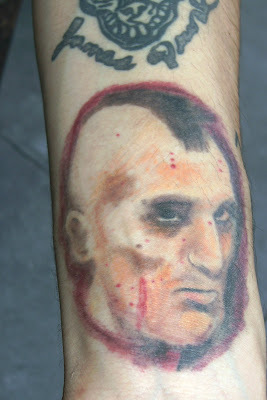 The turning of one's head can result in missing an amazing tattoo. I met Jenny and her friend Kate by chance coming out of the subway one day. 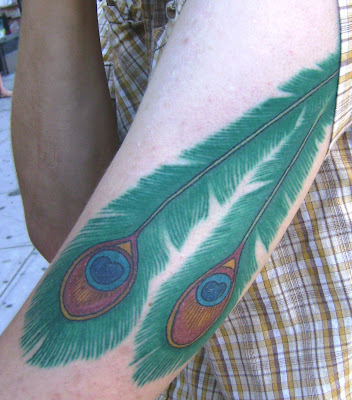 Generally, the peacock represents self-worth and valuing oneself. In Jenny's words, more poignantly, "be happy with your feathers." The peacock was tattooed by Poohki at Steady Tattoo in Minneapolis, Minnesota. 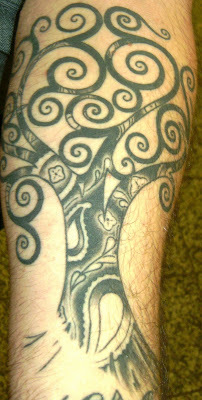 The phoenix was inked by Trevor Kennedy at the same shop, although he now works in California. Thanks to Jenny for sharing such wonderful tattoos with us here on Tattoosday! Although it was Jenny (here) who was visibly inked, Kate also had a tattoo, hidden from view. So when I was done talking to Jenny, I asked Kate if she wanted to share, as well. 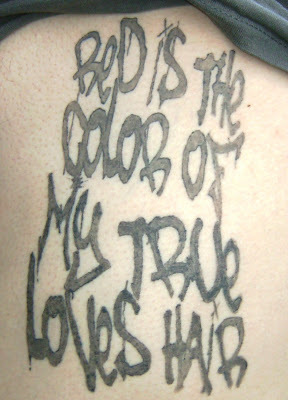 (A Tattoosday production note: I never solicit back tattoos but will happily feature them, when offered). This piece consists of a couple of snakes consuming one another, a symbol of the circular cycle of life, death, and rebirth. Or, in Kate's words, "what destroys us, sustains us". This tattoo was inked at Twilight Tattoo in Minneapolis, Minnesota. Thanks to Kate for baring her back and sharing her snakes with us here on Tattoosday! It certainly does! Thanks Anonymous!